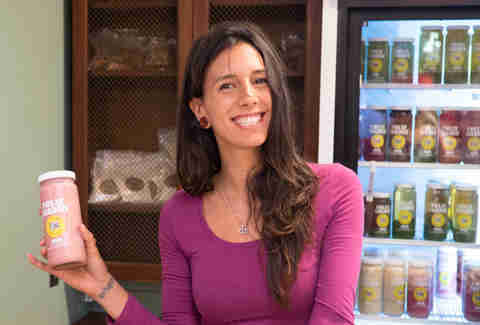 Open for just over a month, Liberty Public Market -- the 22,000sqft food mecca in Point Loma's Liberty Station -- has been attracting huge crowds of locals intent on finding the most delicious items to eat and drink since day one. With dozens of vendors vying to fill your stomach, deciding on what to eat can be overwhelming... and that’s exactly why we’ve cut out your guesswork and figured it out for you. Scroll down for a primer of the 15 best things to eat (and drink) in Liberty Public Market. Why choose between Stuffed!’s two core items (burgers and mac & cheese) when you can have both? This already popular burger has a thick and juicy patty stuffed with American cheese that’s topped with spicy mac & cheese, thick-cut bacon, and cheese sauce. On the side, you get a healthy portion of crisp, fluffy tater tots. 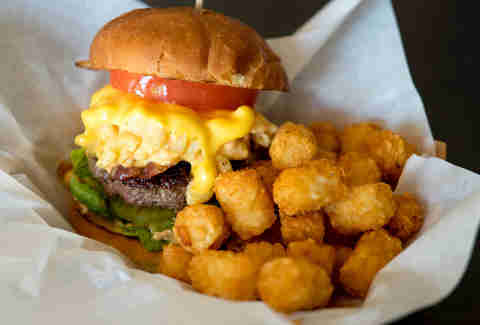 Even if you don’t think you need tots with this behemoth of a burger, you do. 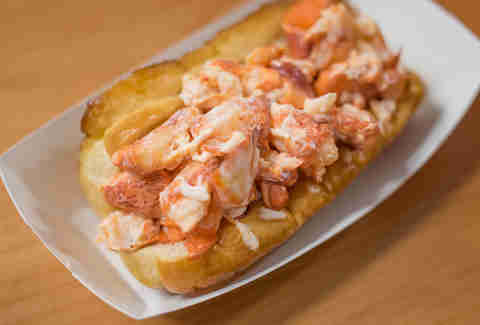 A quarter-pound of plump and sweet lobster stuffed inside a hot, buttered roll sounds pretty excellent any time of day. Here, you can get your lobster fix one of two ways: warm, with melted butter; or chilled, with mayo. Either way, it’s going to be delicious. 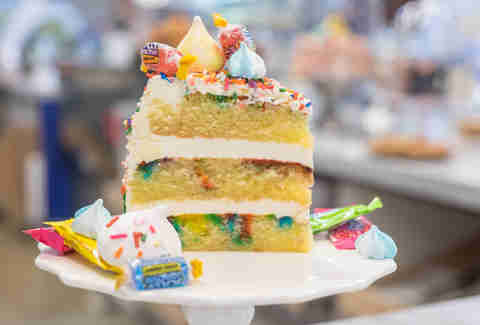 This is the vanilla confetti cake with white chocolate filling and plenty of sprinkles that should have been at every one of your past birthday parties. On top, there are colorful meringue drops and still-wrapped candies. The only thing that would make this cake better is a big scoop of ice cream. Luckily, you can get just that at Scooped! (the ice cream counter within Crafted’s space). This sweet, creamy pink drink made with house-made almond milk blends beets, yams, carrots, honey, and dates with a pinch of cardamom and cinnamon. The touch of spice makes it taste a like a lighter, healthier lassi. And since it comes bottled, you can stock up for when you're craving one of these at home. 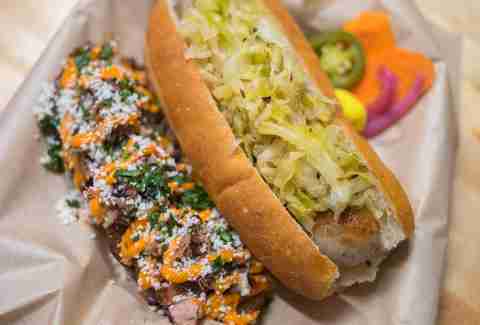 The flagship sausage starts with a tender link made with Salmon Creek Farm pork that’s covered in sauerkraut, tucked into a Bread & Cie hoagie, and served with a side of pickled veggies. Make yours a combo with pig fries and you’ll get a side of thick-cut chips topped with harissa aioli, Cotija cheese, and three types of pork: confit ham hock, shredded bacon, and crumbled house sausage. 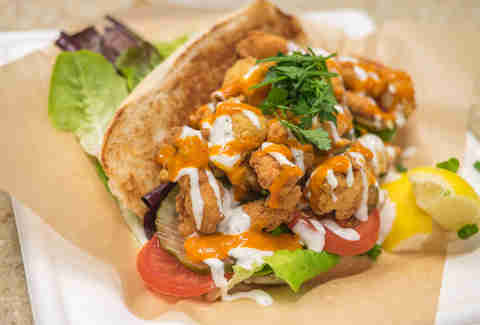 Plump fried oysters on a buttered and toasted French roll would be great by themselves, but the drizzles of house sauce and spicy remoulade make this best-selling sandwich a must-try item. 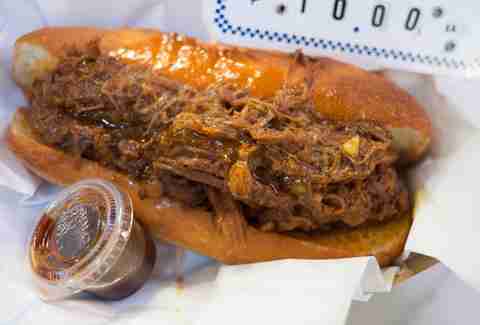 Most of the items at this butcher shop require cooking, but you can find instant gratification in the tri-tip sandwich with sweet and tangy Crooked Crown “The King” sauce. There's a good chance it’ll only take a few bites for you to be seriously hooked. Luckily, it comes with a little extra sauce on the side, and you can also buy the addicting sauce in jars to put on everything at home. Anyone looking for a light and healthy bite that delivers on flavor without being too filling should head directly to Cecilia’s Taqueria for a wild-caught fish taco. 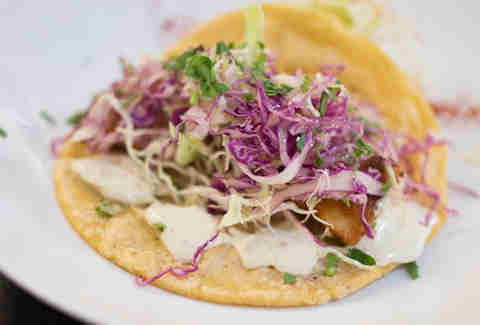 You’ll find a tender fish fillet wrapped inside a homemade corn tortilla, and topped with crunchy red & green cabbage, lemon essence oil, and caper remoulade. Stumped by all the options here? 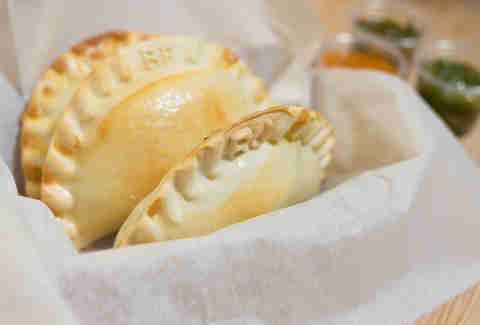 Some of the most popular flavors include the beef and chicken empanadas. Make sure you get a good portion of one (or all four) sauces -- chimichurri, chipotle chimichurri, roasted tomato, or creamy celery -- before walking away from the counter. A little chimichurri is a good idea, but a lot of chimichurri is even better. 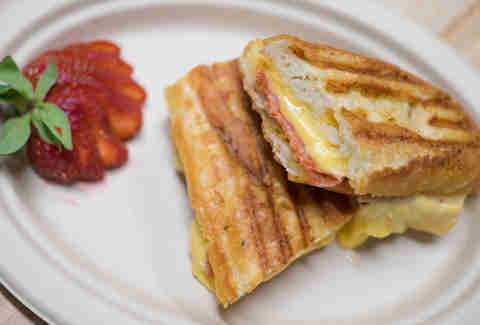 Grilled cheese is always a good idea -- a notion that is completely backed up by the name of this gouda & spicy soppressata sandwich from Venissimo. 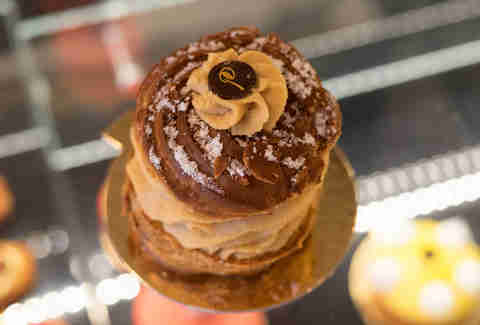 Cream puffs are an iconic French treat, and the bakers at Le Parfait Paris do choux justice with this delicious pastry filled with caramelized hazelnut cream. 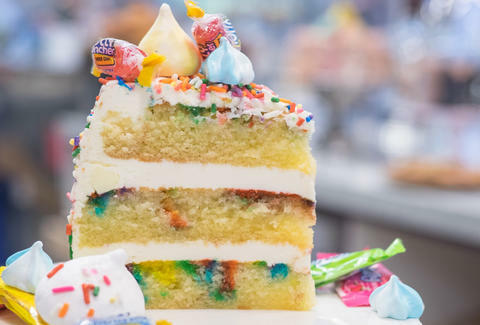 It’s one of many tempting options in the dessert case, so if for some reason they’re not in stock during your visit, don’t fret -- you’re sure to find something equally satiating for your sweet tooth. 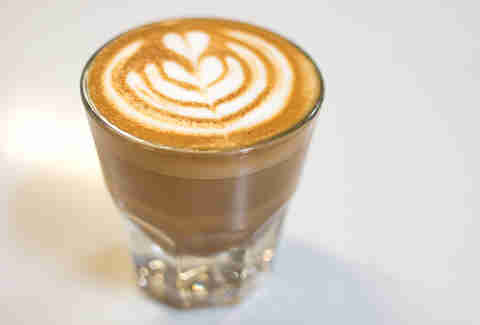 Made with two parts milk and one part espresso, this potent drink can be downed in three glorious gulps. If you’d rather have something cold, the Kryptonite (mint-infused iced coffee topped with a dollop of cream) is what you want. One of the shop’s best-selling items (at Liberty Public Market as well as the Solana Beach location) is this crunchy bowl of organic Asian slaw with cucumbers, soba noodles, peppers, green onions, avocado, cilantro, Thai peanut sauce, and roasted peanuts. Even without the herb roasted chicken (for the vegetarians out there), this dish makes a great meal. 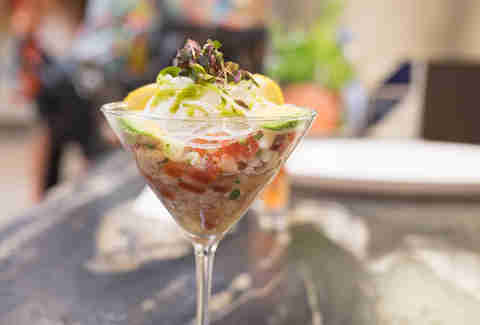 Belly up to the raw bar at this local sustainable seafood monger for a martini glass filled with fresh, mixed seafood ceviche topped with microgreens and lemon wedges, with a side of corn chips. There are also oyster shooters, if you want to continue the theme of eating fish out of cocktail glassware... which, duh. 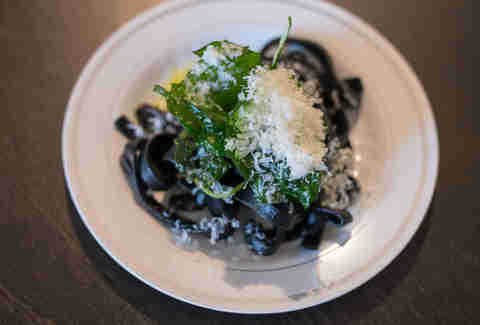 Pasta and sauce selections at this vendor rotate seasonally, but if you see squid ink fettuccine on the menu, go for it. The noodles are black as night, and the flavor is actually quite subtle, which makes pesto a smart sauce choice. The sharp and salty notes in the cheese and herbaceous flavor of the pesto make this dish come together and sing. Erin Jackson is a San Diego-based food writer and photographer who loves sharing her latest finds. Follow her on Twitter @erinjax.